This is an inventory management tool. Managing businesses, however small, requires management of their quotations, invoices, purchase order (PO), credit notes, delivery notes/ packing slip, inventory, and stock. When you are trying to run more than one such business, you have problems multiplied. Additional staff to take care of these issues not only will cost you but could easily worsen the situation by introducing human errors unless these people are well trained and even then there could be honest mistakes and hence trouble. A suitable inventory management system can go a long way to let you manage the mess. A tool that could manage purchase order (PO), quotations, invoices, credit notes, delivery notes/packing slips, inventory, stock would be very useful and you have a tool like that here. It will also let you manage more than one business. The tool will keep the data related to the operations isolated. Entire gamut of operations such as creating purchase order, receiving payment, scheduling recurring invoices, creating credit notes, packing lists, etc. are made available through this tool. 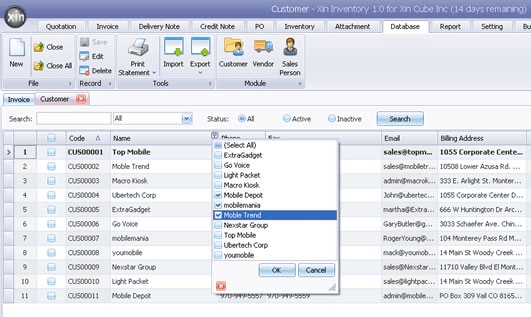 With Xin Inventory Software point alert will ensure that you have the items ready when you need them. The standard documents are based on templates and could be generated with least amount of efforts. These templates could be easily customized by uploading your business logo and other details. Purchase order (PO), invoices, quotations or estimation, credit notes, delivery notes/packing slips, customer statement layout, etc. are going to look professional. You could create your very own template too. The interface is well laid out. Controls are easily accessible. This is a very good product and if you are looking for a tool like this, this could be it.